Cave Ice is almost identical to Ice in all its properties. 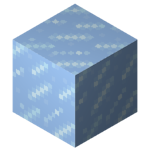 It drops Ice, when mined. Another difference lies in map generation: Cave ice will be generated in ice sheet biomes and tunnels and caves may be carved through cave ice, while for ordinary ice, this is not the case. This page was last modified on 6 March 2019, at 18:47.